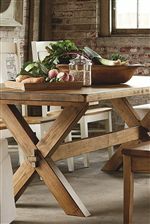 The most industrial looking table in the group, this hand crafted dining room piece is made from solid wood with simple lines that give it rustic looking charm. Seats 6-8. This piece is available in 72", 90", and 108" options. The Bench Made Artisan Dining collection is American through and through. Each item is crafted from timber harvested in the Appalachian Region and then uniquely bench-made by our own Artisans in Bassett, Virginia. Each item is made to order, one at a time. 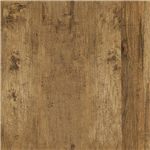 American hardwood lumber is selected for its character so the natural beauty of the wood is captured and highlighted. 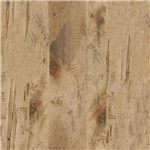 Distinctive wood grains, hand-planed natural wear and stunning finishes give each piece an heirloom quality. Made entirely of solid wood, you can be sure these styles will stand the test of time and be a gathering place for family and friends for years to come. The Bench Made 72" Rectangular Table with Industrial Style by Bassett at AHFA in the area. Product availability may vary. Contact us for the most current availability on this product. 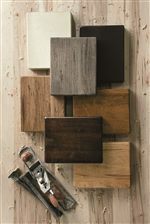 Finish & Paint Options Available in a number of finish options through special order methods. Contact us or visit us at one of our retail locations for more information. Industrial elegance meets the charming beauty of farmhouse simplicity in the aptly called, Bench Made furniture collection. This hand made furniture collection will fill your dining space with a soft eclectic beauty that allows you to create a matching group with your favorite finish or a mixed ensemble with perfectly paired finishes, each one working to complement and accent the others. This kitchen and dining room collection includes hand crafted table and chair sets as well as accent storage pieces. The Bench Made collection is a great option if you are looking for Transitional furniture in the area. Customize Items in this Collection with Your Favorite Finish Pictured Here. Contact us at one of our Retail Locations for Specific Pricing and Availability. Browse other items in the Bench Made collection from AHFA in the area.